Whatever the reason that you need to soundproof a room -- noisy teens, blasting music, a busy street or a media room -- you don't have to use your entire savings to do so. Furniture, bookcases and even unframed art canvases -- all help deaden the noise that penetrates a room's walls without a major renovation or a huge budget. 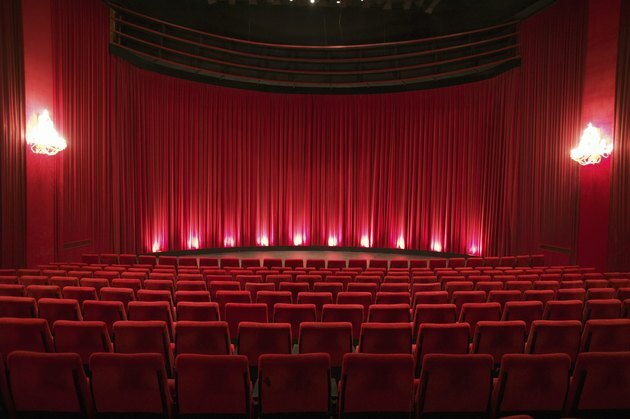 The soundproofing techniques used in theaters works in homes: long heavy drapes. Floor-to-ceiling drapes along a noisy wall create a buffer that dampens noise -- the heavier the fabric, the better. Attach a curtain track or curtain rods to the ceiling or at the top of the offending wall. Keep the curtains closed, which can also create an old-time movie theater feel in your media room. The closer to the source of the noise that you hang the drapes, the better chances you have of deadening the noise. To dampen the sound from noisy streets, add several layers of fabric or window treatments to windows. For example, dress windows with Venetian blinds behind a set of curtains or add multiple curtain layers. Most of the sound that comes into the home from outside comes through the windows, so that's the first place to start soundproofing when the noise comes from outside the home. Inexpensive roll-up woven or fabric shades also create a sound buffer between the room and the window glass. When friends visit teens in their room, you can expect more noise and music coming from the space. Add bookcases to shared walls to help deaden the sound. Line the shelves with your favorite books; the paper pages, bindings and covers all help to absorb the sound. If the noise comes from above, add extra area rugs to dampen the noise that travels through the floor. When you have unframed canvas paintings or prints hung on a wall, you can add cardboard or egg-crate foam sandwiched between the canvas frame on the back and rehang them on the wall to muffle sound. But you don't have to stop there; fabric wall hangings or tapestry add a decorative touch while deadening sound that comes through the walls. Rooms that are not carpeted bounce sound against the floor and ceiling, echoing it throughout the space. To deaden sound, add area rugs or woven mats to help soundproof the room. If you're building new or renovating a home, and it has open walls, add insulation inside the home to shared walls. Besides adding an extra layer of thermal resistance, insulation also dampens sounds. Add a second covering of sheetrock to shared walls between a laundry room, a master bedroom or a kid's room for soundproofing effects. The cost is minimal, but worth the added hassle when the walls are open.